As a cold and warm front collided. It left passers-by wondering if the lightning would ever stop. First beer of the week. And the sight of RED. We made our way to our seats. I heard a sickening sound. Or the split of a head as it meets concrete. Like my beer pouring out of its tap. Is this what I was supposed to do? Is this the final test? As the loops straightened out in my head. Someone else said help is on the way. THANK GOD SOMEONE ELSE IS HERE. But they know they are ok. He was standing right next to ME. I was telling someone about my degree. Oh ok. I get it. We need more people like that. I AGREE. We need more people like that. I’ve never seen blood pouring out of a brain. I haven’t signed up for this. Maybe we need more people like that. Sarah Ramsey is an incoming senior at Boston College with a major in Operations Management and a minor in Medical Humanities. She is the Managing Editor of the Medical Humanities Journal of Boston College and a trip leader for the Appalachia Volunteers. Sarah aspires to use her business background to improve and expand health opportunities. I first discovered Kelsey’s website, Help Each Other Out, two years ago while doing research on how to comfort people living with serious illness. I loved her honesty, compassion and gentle humor in her writings about how to reach out to people in distress. She was learning to live with breast cancer, creatively weaving her personal experience with her expertise in social work and social justice. Drawing from her research, insights and stories, she developed an innovative training program to teach relational skills called Empathy Bootcamp. We chatted on the phone a few times about our common interest in the power of empathy and our writing projects. I found her to be warm, encouraging and generous, even though she had recently endured losing her home in a terrible fire. Fortunately, no one was hurt. Later in 2015, I was delighted to hear she was well on her way to landing a book deal, co-authoring a book with the viral Greeting Card designer of Empathy Cards, Emily McDowell. 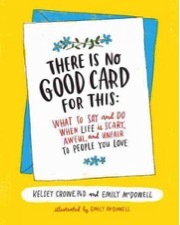 Kelsey and Emily’s book has just come out this January, called There is No Good Card for This: What to Say and Do When Life Is Scary, Awful and Unfair for People You Love. It’s a wonderful resource with lively, vibrant graphics and illustrations, yet full of practical guidance for the delicate art of reaching out. Congratulations on your book! What experiences convinced you to write There is No Good Card for This? Kelsey: My experience with cancer was an invitation to write my book. I began writing when my friend in Grad school got cancer, and I wanted to reach out, yet I was hesitant. I felt stuck. What should I say? How did I belong as a friend now? My experience of feeling so powerless as a friend led me to exploring the cause for my hesitancy to reach out to people who were seriously ill. By doing research and interviews, I gathered material about how to offer help for people in times of need. While developing this book, I worked as a faculty member at California State University, teaching courses on public policy. I found research that convinced me how important it was to publish a guide for reaching out to people in crisis. I created a guide book, and I tried submitting this to publishers, but it didn’t take off at first. And then, I got diagnosed with breast cancer. That changed everything about how I wrote about helping each other, and I revised my book. I realized I needed to make my private life public. I began a website called Help Each Other Out where I could share my own experiences living with cancer as well as share about so many hard times like loss or divorce and others that affect many of us at one point or another. In addition to the Help Each Other Out website, I collaborated with several empathy experts to develop a training program for lay people and healthcare settings called Empathy Bootcamp, which gives people communication tools for being with others in their time of suffering. With a stronger platform developed for my book, I again worked to find a publisher. Ideally, to enhance my book project, what I envisioned was having it illustrated. I had heard of Emily McDowell, and loved her Empathy Cards, which were going viral in 2014. As a woman who had been through cancer herself, Emily designed greeting cards for people coping with illness. I had wanted a comedic tone to illustrations for my book, and she seemed like the perfect person to approach, but I wasn’t quite sure how to connect with her. Then, one day, amazingly, I received a text from a friend at the New York Trade Show who was sitting right next to Emily! That friend connected with Emily in person, and introduced my book project. Soon I followed up and called her. I found out that she had also wanted to write a book about empathy. We talked, and she was pleased that I had already written and researched so much of the material—that the project was fully vetted and ready for her input. So, we created the book together with her illustrations, humor, and ideas. Kelsey, what a remarkable story. It sounds like it was “meant to be” that you connected with Emily—fantastic timing, Kismet. You were the perfect duo to create this book! If you could sum it up, what are the five main takeaways of your book, There is No Good Card for this? Err on the side of doing something rather than doing nothing. If you are trying to decide whether to reach out or not, it’s better to offer whatever you can, rather than hold back. You can manage how much you give. Comforting someone can be manageable for who you are, and where you are in life. It’s much more helpful to listen than to find that elusive “useful” thing to say. Even if you’ve been ill with cancer, it’s important to respect and remember that each person’s experience is unique. Use your experience with illness as a good reason to listen to each other. Give what you know how to give; and don’t wait to be asked to give. A few years ago, you started an innovative training program, Empathy Bootcamp. Many of your participants are healthcare providers and caregivers. How do you teach empathy—or how do you teach a way to “operationalize empathy,” as you put it? Kelsey: First of all, empathy is about a way to live and not just about doing your job well. Empathy is a part of connecting and listening in all areas of our lives. In the past few years, empathy has become a popular buzz word. People are interested in learning empathy skills, especially in our digital age. In my Empathy Bootcamps, I focus much of the training on listening skills which are essential to putting empathy into action. I present three different categories of listening that each require different skills. It helps to distinguish empathic listening from the other kinds, as empathy is so important as a first step to establishing a relationship. Empathic Listening: This is listening that builds trust. We start with empathic listening before we go to other interactions. Evaluative Listening: This is where we ask questions to offer up a judgment or assessment. Fact-finding Listening: This is when people ask a lot of questions because they need specific knowledge to be helpful, like when networking with someone to appropriate resources, or when being a patient advocate. Empathic listening is the kind of listening we should do most of the time. The other forms of listening can come across as judgmental, or take the person off track from what they truly want to talk about--so use evaluative and fact-finding listening with careful discretion. Yes, so we need to start with empathic listening to establish a relationship with the person before we move into problem-solving mode. I see how empathic listening lays the foundation of trust and understanding before we get to evaluative listening and fact-finding. Otherwise, we feel more like a commodity than a human being! I’m so glad you are teaching this vital skill in your Empathy Bootcamp. On a more personal note, I was wondering if you could share an experience of being comforted when you were first diagnosed with cancer? What were the gestures of comfort that touched you the most? Kelsey: It wasn’t so much the gesture itself, but the timing of that gesture. One evening I was so tired, felt so alone and shut down. I was pushing myself hard to make it to the end of that day. And suddenly that evening I received a delivery of flowers. It was so spontaneous and beautiful. Perfect timing. Another time I told someone I was afraid I was going to die. She just hugged me and held me for a moment, and it helped me so much. What you said convinces me that the little ways we reach out can be vital. One simple gesture just might just come in the nick of time to get us through hell. Kelsey: Right. Our words or actions don’t have to be perfect--just reach out. On my worst days, it was such a relief to know someone cared. So true, Kelsey. It’s been a pleasure talking with you today—I could talk with you all day! Thanks so much. There Is No Good Card for This: What to Say and Do When Life Is Scary, Awful and Unfair for People You Love. This patient on my mind—let’s call him Sam—is smart. Sharp might actually be a better word. He knows what he should say to get out of here, and he probably even knows how to do it gradually enough so that we believe him. Sam knows our attending thinks he’s afraid of people caring about him, for instance, so he could play that up and pretend to let him in, fabricate a healthy exchange. These are the thoughts I have about Sam on the walk home, typing furiously away at my notes in my phone, with the hope that they’ll stay in the document and out of my head. I think about Sam, what he says, and what he actually means. Sam has made multiple attempts to kill himself. He’s had a tough life, and I won’t attempt to explain the root of it all. He accepts his pain as constant, and he does so without drama. He fits the criteria of involuntary commitment because he’s at what’s considered an “unacceptably high risk” of hurting himself if he’s discharged, and he’s waiting for placement at a state hospital, where he’ll be for an undetermined amount of time. Sam keeps asking what the point is, saying that he’ll kill himself when he leaves, that he doesn’t envision a future for himself. Still, he repeats all the things he knows will keep him here. Why does he set himself up to be institutionalized, if he really wants to leave and end it? Does he want help, but is so incapable of asking for it, that he’ll say whatever will compel us to keep him here? How can we connect to him, if that’s the case? At first glance, Sam looked to me like a lot of teenagers do, with this angst sort of hovering over him, sulking around with huge headphones on and refusing to show up to morning rounds. I’d catch him at groups, sitting with his hands glued in his pockets or folded against his chest. When I say Sam is smart, I mean I think Sam is probably a lot smarter than me. He’s cynical, with a sort of wisdom and a dry humor that ages him and makes him easy to relate to. Sam will laugh at you when he knows you’re trying to “doctor” him, an effective way to puncture and deflate your ballooned ego. He brightened up a little while we played scrabble during group one afternoon, making me think for a moment, I don’t know, maybe there’s a chance for him. It’s frustrating, maddening even, to see a guy as sharp, as funny, as “normal” as he is, describe how painful life can be, and watch him carry that pain so complacently. But I can’t be mad at Sam for being in the kind of pain he’s in, I can’t even blame him for wanting to hurt himself. The fact is, I’ve only been here a few short weeks. Who am I to say he’s being selfish or pessimistic? Through his charm, in a way, Sam throws a wall up around himself, one you feel like you can’t tunnel through no matter how “real” you are with him. How can you really know him? How can you understand what he’s going through, and how can you know what to do to fix it? I like to check off boxes, to feel like I’ve accomplished something. I like to feel as though I can walk out of a patient’s room having made a genuine attempt to contribute to their care. With Sam, it feels impossible to do that. At the end of the day, I am one of a batch of students with stiff, starchy white coats that cycles in and out of this locked unit for six weeks at a time, eager to “let these patients in,” but it’s likely that nothing will change for Sam and his painful reality in that time. I pursued medical school with an idea. I even wrote about it in my application. I wrote that I wanted to become a doctor so I could meet people from all over, each with a story of their own, and that I could take a little piece of them with me and that all those pieces would add up to something meaningful. I think this became a part of my mindset growing up. My dad was in the military, and he traveled all over the world flying huge carrier airplanes. My siblings and I lived on a military base with my mom, and with each trip we waited for him to bring back all kinds of souvenirs and stories. I started to dream up all the places he went to, and the people who lived there. I kept a picture of a pyramid he took while he was in Egypt on my bedside table. I imagined people with lives so different from mine, and I convinced myself that as a doctor, I would find the most opportunities to encounter all these people, to get to know them and become a part of their stories while they became a part of mine. When I met Sam, I began to wonder if all those pieces I’ll take with me would eventually show me how futile this job can feel. It started to feel like so many of the pieces we take are the ones full of pain and hopelessness, frustration and grief, and fear. My short experience with Sam puts a stark but simple realization back into view. I can’t fix his life, or hand him some profound new way of dealing with it. And it’s not about what feeling of accomplishment I can gain from working with him. All I can do is try my hardest to know where’s he coming from. I can educate myself on all the options he might have—medications, therapy, or anything else I can think of. I can help lay them all out for him and try to be prepared to answer any questions he might come up with. I can be honest with him, and I can listen. I can try my best to know what he cares about most, what he fears most. Maybe that’s unsatisfying, but I think that’s sort of the point. You have to keep trying, whether or not the feeling of self-satisfaction ever comes. Jacqueline Hodges is a third year medical student at Tufts University School of Medicine. She is from Gainesville, Virginia and graduated from the University of Virginia, where she majored in biochemistry with a minor in global public health. Jacqueline is pursuing a dual degree in medicine and public health at Tufts and plans to do a residency in internal medicine. Outside of medicine, her interests include graphic design, hiking and traveling, and eating Korean and Southern food.